1：I wonder if we can just start off a bit about, talking about your background. And how did you get involved in singing? my wife 11 years ago said i should start and also try writing my own songs so i did , if not for her i may never have tried singing or writing! 2：Please tell us about the new album.Why did you choose " Start Livin " as your album title? its the first song on the record and it really sums up the message on the album that life is short and if you dont start livin it will be over before you know it. 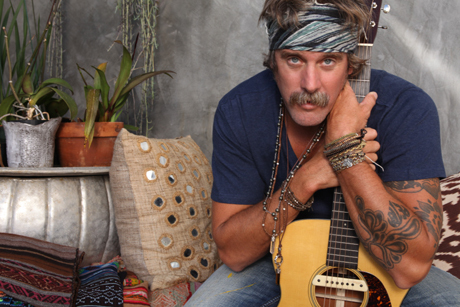 3：How do you want your listeners to enjoy your new album " Start Livin " ? Is there any specific situation or place? i am very proud of this album and think it has many great things to say for the listener. 4：What did you use to produce the sound? many different interments that i have never used before but for the acoustic sound it was all MARTIN GUITARS and then we used uke,lap steel,banjo,resonator bass,many different percussion things !!!!!!!!!!! 5:What does the 5th album mean to you in your life? making music and surfing its a dream to have both of these things in my life as my career i love doing them both!!!!!!!! !every album represents that to me another chapter in my life of doing what i love to do !!!!! 6:Why do you think your music attract such a big Japanese listeners? i don't know, i have always had a big Japanese following ,i think i just have a connection with the culture and country i do love it so much ! 7：Is music integral to every day of your life? its the basis of life itself we are all moving to a rhythm in some way everyone has their song! 8:What would you consider as a good music and a bad music? there is no bad music i think all music is beautiful!!!!!!!!!!! 9:What beauty means for you? smiles or is having fun life itself is beauty!!!! 10:What does silence means for you? i dont know i havent heard that in a long time! 11:What kind of bird do you like ? 12：When do you feel happy? Donavon FRANKENREITER :because i am alive!!!!!!!!!! 13:How do you keep your youth? surf surf surf and having kids!!!!!!!!!!!!!!!! 14：Where is your favorite landscape? 15:What would you do if you were left alone on a desert island? try to find waves and make a board and surf!!!!! 16：Do you like Japan? Could you give us some of your good memories of Japan? everything about japan i love climbing mt fuji and watching the sun rise was one thing i will never forget!!!!!! 17：Where is your favorite Japanese landscape? Why ? anywhere by the coast i just love teh ocean and surfing in japan its so fun!!!!!!!! 18：I heard you are planning to come to the tour " START LIVIN’ JAPAN RELEASE PARTY " and " GREENROOM FESTIVAL&LOVE FOR NIPPON " in May 2012.Fans in Japan are so looking forward to seeing your show soon.Anything special you'd like to do during your stay in Japan? give everyone a huge hug and let them know i have not stop thinking about them since the tsunami!! i love them all so much and the country i am so happy to be coming back to see everyone once again !!!!!!!!!!!!!!!!!!!!!!!!!!!!!! 19：How do you like playing in Japan? one of my favorite places ever to play concerts! 20：Please any (brief) message for Japanese fans. see u all soon and thank you for all the support love you and START LIVIN"
Answer's Translation: SURFROCK INTERNATIONAL INC.
1：Tell us about the new album" When You Grow up".How would you describe it?Why did you decide to use the title of the 1st track of the album as the actual album title? This album is a lot about "growth". A lot of the songs were written in a period of my life when I did a lot of "self-reflection" and looking at my life, so some of the songs reflect that. Also... there were a lot of new experiences making this album: Recording it in England, working with a new producer, and co-writing a lot of the songs on this album. I realized that I wanted the title of the album to maybe be the name of one of my songs (like how I did for the first album). And then it just hit me that "When You Grow Up" would be perfect, because I knew these songs had a lot to do with the idea of 'growing up'. I also like the question of "When do we grow up?" And hopefully, we never get to a point in our lives when we stop growing. Hopefully we keep growing up for the rest of our lives. Ethan Johns, the producer, came up with the song order, and this song just happened to be the opening track, which I think is perfect. 2：What does this second album mean to you in your life? It is a great sound for you.Tell us about the producer, Ethan Johns. This was a big learning experience for me, inside and out. On the outside... it was my first time recording out of my comfort zone, which is usually Los Angeles. And also, my first time working with a new producer. It was such an honor to work with Ethan Johns. His approach to recording music is very "old school". We recorded almost everything to tape. And we would do many many takes of a song until we found the right one. It was a slow, but well-thought out process. He really cared about what we were making together. And because we were recording in a whole new country, far away from home, it actually made me focus a lot harder on this record. As far as how this affected me on the inside... I felt a lot of pressure that this album had to be as good as, or better than my first album. And it really got into my head in a negative way. Normally, I never think about that stuff, or let "business" affect my writing. I refuse to let that stuff affect my creativity. But it kept appearing and making me doubt myself and my songs at every corner. I'm usually very self-confident in my art... but the business side of things really made me insecure. I had to learn how to eventually overcome that. I still struggle with it from time to time... but I'm learning how to accept it in my life, and then move on from it. 3：When did you first feel like a grown-up? Hmm.... I think when I got married, which was only 1 year ago! But I immediately felt like a "woman". Marriage is a big responsibility. I think the biggest thing I've taken on in my life. I didn't expect anything to change in my life when I got married. So I was very surprised to feel an immediate change. That was a big day for me. 4：In 2009 " A GOOD DAY ", in 2011 " When You Grow up "....Has the recording process changed though the years? Mine definitely has. With the first record, we went into the studio without a plan. For each song we were like, "let's try this...now let's try this". We just sort of made it up as we went. With this second album, I wanted to go in with more of a plan. So before I went into the studio, I demoed each song at home, and thought out a lot of the instrumentation, so that the album would have some kind of theme or a feeling. And then, the way that Ethan records is very different from Joey Waronker's. Like I said, he has a much more patient, "old school" approach to recording. I enjoy recording both ways. I don't know how I will record my next album! 5:In regard to your Japanese bonus track "Love", What made you want to cover that song by John Lennon? It is one of my favorite John Lennon songs. I remember hearing it when I was a teenager on one of my Dad's old vinyls. I just love the lyrics. So simple, yet so full and true. Love really is all of those things. And at first sight... those things are so simple and small, but really, those are sometimes the only things that matter. 6:What do you care about most when you make a song? If I start over-thinking things, or trying to change words around so they "sound" better, that's when I put my guitar down and just stop. The songs that are the most true to me, are the ones that take no effort to write. They just sort of come to me and flow out without me thinking about it. I vow to never write a song that isn't genuinely me. 7：What do you do for a change? I love traveling with my husband! But that is a big thing... on a day to day scale, I love to make soups! I love cleaning the garden and making the plants look pretty. I love to sew and watch movies and read and paint. I love to do all of these things. They all inspire me creatively and bring me peace. And I feel like all of that creative energy funnels out thru my song in the end. 8:How do you get inspiration for your songs? They are all mostly based off of my own life experiences. So it really comes down to experiencing life! And taking note of things. Looking at myself. Being in touch with my feelings. Or being in touch with someone or something else I see, and having compassion for their particular experience. 9:What is the most precious thing in your life? 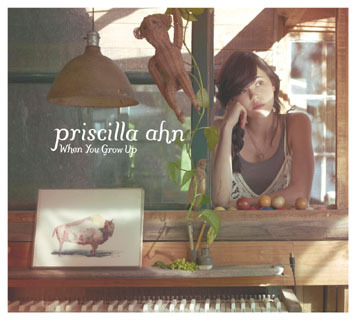 Priscilla Ahn :My loved ones. 10:Please tell us your favorite lines of any song in this album “When You Grow up". From my song One Day I Will Do: "This I promise you: One day I will do. I swear. I swear". When I sing this line... I really feel it and mean it and promise it. From Oo La La: "You feel lonely and shy, but you take the empty seat next to the cute guy". I just love the idea of this! It's something I'd probably never have the courage to do back when I was single... but I would wish that I had. From I Don't Have Time To Be In Love: "I don't have time to be in love... kissing you on the cheek. 200 times a week". I just love this imagery. It makes me feel so cozy and in love. 11:What made you go into music? Both my parents played a big role in my life in this way. My Mom was always singing with her beautiful voice, and playing piano. She inspired me to start singing from a very young age. And then my Dad always encouraged me to learn the guitar -- so I did. And I fell in love with the music he listened to (Neil Young, Bob Dylan, The Beatles, Pink Floyd). 12：What is the most amazing experience you've ever had? That's a hard question... I consider so many experiences amazing! Like getting married in Hawaii... snorkeling for the first time... our honeymoon in Kyoto. Oh! I can think of one very special one. 2 years ago, my husband and I spent 2 weeks for holiday in Tokyo and Kyoto and Koya-san. We rang in the New Year at the Zojoji Temple. At the end of the countdown, we released these clear balloons into the sky... and everywhere you could see balloons rising up from Tokyo. It was so magical! And then going inside the temple where the Monks were chanting and drumming...it made my heart flutter with emotion! And then visiting Koya-san, and waking up early in the morning to hear the Monks chanting. I'll never forget the sounds and the smell of incense... it was very moving. 13:I heard you love Japan. What is the most beautiful place you've ever been to? Well, haha, I think Koya-san is one. Although, it was so cold, we didn't get to see much of the town. My husband and I spent our honeymoon in Kyoto as well. We love that city. It is so beautiful in Fall, Winter, Summer. I'm hoping to be there one day to see the Sakura season in Spring. 14：What does beauty mean to you? Why? True beauty to me is something pure. Natural. Like what attracts me to things in Nature, like flowers and trees and the ocean. Beauty is simple, and doesn't try. It just is. I feel like all people have this beauty inside of them, if they can believe in it in themselves and just be. 15:What surprised you most when you first came to Japan? I think how cute everything was! I love all things cute... and Japan has a lot of KAWAII things in it, which is part of the reason I think I love it so much. Also, the sushi blows my mind! 16：What kinds of music have you listen recently? 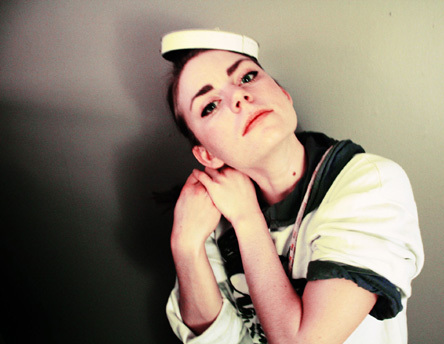 I have been listening to Twin Sister's EP "Vampires With Dreaming Kids". My favorite track is "I Want A House". I listen to this song almost every morning. It makes me feel really good and happy. 17：What have you been interested in recently? Making soups! I've been touring through Germany and other parts of Europe where it feels very Fall-like. I love this season. It makes me want to be at home, and making my house cozy, which means cooking soups! I've also been getting into mythology stories. I've learned bits and pieces of mythology in school, but now I'm fascinated by them. I think because now I realize there are many lessons you can learn from these stories that can be applied to our lives. 18 : What kinds of flowers do you like? And why? My favorite flowers are wildflowers. I love that they're not perfect, and that's OK. And their "woody" scent. I also love white Lillies, because their aroma can fill up a whole room. When I'm home alone, their presence keeps me company. I also love "Chinese Lanterns" in the Fall. They remind me of when my husband and I first met. They were the first flowers I ever gave to him, on his birthday. 19 : What kinds of birds do you like? And why? Hmm... I've never really thought about this before. Well, I love watching hawks fly. I love the quiet "hoo hoo" sound the owls make at night. We have one normal brown bird that comes to one window of our house, and taps his beak against it to attract his female. It's so cute! And I love any bird that loves to sing. 20：How do you see your musical journey in the future? I hope that it keeps expanding. I'm interested in doing so many different projects. I really want to try making different kinds of music. Trying different styles of music that I love. It of course, has to still be genuine of me, but I'm experimenting with that a little right now, and it's been really fun. I would also love to write more instrumental music. I'm very inspired by film scores. And I would love to write a children's album that adults can listen to as well. 21 :Please any (brief) message for Japanese fans. Thank you so much for your continued support! Japan will always hold a very special place in my heart. If it wasn't for the fans supporting my music, I'd have never had this opportunity to visit the country and fall in love with it over and over again. For that, I thank you all so much. 1:In regard to your new album, what made you collaborate with Rasmus Faber? I've admired his musical gifts for many years and I really believed that he could take the productions that I had made and improve them to the highest quality. He has been very humble to me during the collaboration and he has really listened to what I have wanted through the whole working process. 2:What does this album mean to you in your life? Creating music is to me a way of ventilating my thoughts of everything I experience in life. My music is very personal to me, so it's not always easy sharing it with others. At the same time, it's the only thing you really want - you'd like everyone to hear it! Making this album has been very confirmatory to me as a musician, it feels good to be able to hold your very own CD in your hands, knowing that you really has created something concrete. 3:Why did you decide to use the title of the 6th track of the album as the actual album title? The lyrics of "Dear, Let It Out" really mean a lot to me. There are so many, especially young, people out there that inhibit themselves. They never really dare to act and express what they really like and think about life. I want them all to just set themselves free, to speak out and do whatever they like. I think this message comes back in many of the songs of the album, not only in "Dear, Let It Out", and therefore I wanted to use that phrase as the name of the album. 4:Please tell us your favorite lines of any song inDear, Let it out. I really like the line "I had this soundtrack of my life that I really liked" in "I Am Not Aware". I think it describes how you feel when you're totally satisfied with everything in life. You feel like you're in a movie and the soundtrack of that scene you're in is your absolutely favorite song. You couldn't feel more lucky! I also like "The rain is falling down and the sun is shining at the same time" in "Plastic Garden", because it's my absolute favorite weather and I get this childish happy feeling in my stomach when it happens. 5.Where do you get your ideas for your songs? 6.I heard your favorite weather is the rain. And you have the same title in your album. Why do you like rain? Well, I always get this special feeling of freedom when it rains, I feel like one with the nature. I also love the scent of rain, it's the absolutely best! When I was a little child, like five years old, I loved the rain because it would make the worms in the ground to come up to the air and I was able to collect them and keep them as my pets. I guess that has influenced me as well. 7.I heard you are a medical student too.A medical student and a musician, which do you enjoy?why? I really love being a medical student as much as being a musician, I'm not able to choose one before the other. I really think that these opposite interests stimulate each other in a great way. Variations in life are the best! Though, I'm willing to focus on different interests in certain periods in life. For example, I guess it's better for me to focus on being an artist in my twenties and a doctor when I'm older, instead of the opposite. 8:And as medical student and as musician, what do you prefer?why? As I said before, I can not choose. These different interests gives me so much in different ways. I love the intellectual satisfaction I get when I study medicine, and I love the freedom of thinking crazy new thoughts when creating music. 9:What kind of place is India? India really is the opposite to Sweden, and I find it very fascinating. There are so many people everywhere and most of them are very opened and kind to foreigners. In Sweden most people never talk to strangers on the streets, many people are scared of talking to people who they don't know. I found this interaction with people in India very exciting and I made a lot of new great friends. I'm also very fascinated about the rich cultural heritage of the country; the food, the music, the movies, their religions. Of course, on of the bad sides of the country is the poverty and the injustice of the society. It has been very hard for me, coming from a rich country as Sweden, facing all this illness and poorness. It has been very good though, getting to see the world in new perspectives. It also made realise that I really wanted to become a doctor, I wanted to return one day and be able to really make something for the people. 10：What kind of child were you?What were your ambitions when you were a child? I guess I've always been very ambitious and motivated in everything that I do. I think that everything in life can actually be very interesting and funny, no matter how boring it seems from the beginning, if you really get into it. I think that I've always had this driving force to perform in everything that I do, whether it's about doing maths, learn riding the bike, writing music or learn about the human brain. I think that one of my best features is that I'm very stubborn; when I've decided to learn something, I don't give up easily. My first years I spent playing with my two elder brothers and a lot of boy-cousins so I guess I started the "hard" way by doing typical boy-stuff as climbing, running, doing sports, and things like that. I really enjoyed it and I hated to wear dresses because they didn't allow me to do all these action games that I wanted. Later on I found interests in doing girly stuff as well of course, but it took some years. (Nowadays I love dresses :). 11: Is music integral to every day of your life? Yes indeed. Music is in my head, constantly, when I'm not talking to another person. I'm very often thinking about melodies and harmonies when walking around in the city, I have this silent orchestra playing in my head.Sometimes I get irritable when listening to music because I just want to hear the silence. I have problems sometimes with listening to music just in a relaxing way, because I immediately start analyzing it. But most of the time, I love it. 12:What is the most beautiful place you've ever been to? 1） Kyrkesund, Tjörn on the west coast of Sweden. This is where my family has a summer house. I have spent my summers here since I was born. 2） The tea gardens of Munnar in Kerala, India. 13:What kinds of flowers do you like? Frida :My favorite flowers are white peonies. They are so magnificent and they smell wonderful! 14:What does beauty means for you? Beauty is something that can increase the quality of life. So many things can be beautiful: music, nature, people, clothes, cars, architecture, animals, friendship… However, I think that the most beautiful thing you can experience is when a human really loves himself/herself in a humble way and therefore allows himself/herself to share that love with others. It's so hard to love your fellowmen if you don't feel good about yourself at first. I think that true love shines through your body and makes other people happy. 15：What does silence means for you? It's one of the most important parts of my life. I have to get silence to be able to create music. I also have to be alone a certain time every day, otherwise I get crazy! I have to get my own space to be able to feel good and to be able to be creative. 16:What are you noise (sound) prefer in daily life?Why?And your dislike noise(sound)? [like noise------------] I totally adore the sound of the rain. I also love the sound of my coffeemaker in the morning, when the coffee starts to drop into the coffee pot. [dislike noise--------] The sound of my vacuum cleaner. 17：What would you do if you were invisible? I would search for a tiger and get very close to it. I've always wanted to meet a tiger in the reality. I would also like to observe people when they're just by themselves. It would be interesting to see how they act and if they talked to themselves (I think many people do that, at least I sometimes :). 18:How do you see your musical journey in the future? I'd like to keep on writing and performing music. I would also like to write music to others, for example music for movies, arranged for a symphonic orchestra. 19:What message do you have for your Japanese fans? You are the best! I get so much inspiration from you! I'm really longing for coming over to your country and sing for you! Can't wait! Posted with permission from Victor Entertainment,Inc. All rights reserved by Frida. 1: De quoi vous inspirez-vous quand vous créez votre musique(ou vos paroles)? 2 : Quel est votre bruit préféré et celui que vous détestez le plus? 3：Qu'est-ce que c'est que la beauté pour vous? 4： En ce moment, quell votre chanson（ou CD) préféré?Pourquoi? En ce moment j'écoute l'album"En privé" et plus particulièrement la chanson "Dans la rue", les paroles sont très gaies et très vraies, c'est un petit morceau de vie. 5：Qu'est-ce que c'est, le silence pour vous? qu'est-ce que c'est, le chocolat pour vous? 7:Le plus important dans la vie,qu'est-ce que c'est pour vous ? 8:Qu'est-ce que vous plaît le plus comme odeur ou parfum? 9:Quel est votre passe-temps favori? 10:　Quel est votre moment préféré durant la journée ? Qu'est-ce que vous faites? C'est le moment de l'apéro, je prends un petit verre de blanc ou de rosé, une cigarette et des "rice crackers". 11：Est-ce que vous aimez Japon?Quelle est votre impression du Japon?Donnez-moi votre favorite japonisme,s'il vous plaît. C'est ma deuxième famille et en ce moment j'en ai vraiment la preuve. "Nama biru onegaï shimasu!" 12：Quel est paysage préfére au Japon? Où se trouve-t-il?Pour quelle raison? La montagne à Kyoto en automne. 13：Quel est paysage préfére à Paris? ça se trouve près de Roland Garros, c'est un magnifique jardin avec des serres tropicales. 14：Pouvez-vous me conseiler quelque chose à faire à Paris? 15：Est-ce que vous aimez votre maison?Où se trouve lieu préféré?Quel est l'endroit que vous préféré chez vous? J'adore ma maison elle est pleine de charme. J'aime être dans ma cuisine, préparer un plat et en même temps papoter avec des amis(es). 16：Quels des conseils à donneriez-vous aux japonais fans ? Posted with permission from Clémentine . All rights reserved by Clémentine . 1: What type of child were you of the childhood?Please describe yourself in short word. I was an incredibly shy child growing up.Around ten years old I got very interested in the theater and finally broke out of my shell becoming more social. However, I think to this day I feel more comfortable playing characters than being myself.When I am just myself, I become quite shy again. 2 : We heard that your band name "OK GO" was named by an art teacher. Is this true? Yes,the name comes from something our art teacher use to say to us.Damian and I met at art camp when I was eleven and he was twelve.We had an incredibly stoned art teacher who use to drop pearls of psychedelic wisdom on us.At the end of every mind bending lecture he would then say,"Ok go", as a way of sending, us, his captured young audience out into the weird wonderful world to create. 3：When you were a student, did you like art lesson/class at school? Tim Nordwind:When I was were a student I enjoyed art, music, and theater classes. 4 : How are you involved with your music video planning, production and filming ? We are very involved and hands on with our video production. We take video making just as seriously as the music. Making videos is part of what OKGO does. It's as much an art form as the music, and we really enjoy making them. 5：Was there any particular episode, memory that you experienced during filming of your music videos? We just made a new video for the album version of the song This Too Shall Pass.We built a gigantic Rube Goldberg machine in a three story warehouse with a group of scientists from a collective in LA called SynnLabs. It was incredible to work with such a smart group of people on such a large scale. The machine turned out beautifully and the video looks amazing. 6： How did you feel when you played in Japan? Playing in Japan is wonderful.We always look forward to coming over.As a special bonus the Japanese fans always make us the coolest gifts. A girl named Yuki once made us an incredible flip book of me riding on a rocket ship. 7：We guess that concert tour sometimes tough for your throat and voice. Is there any special care or tool that you take care of your health? We always do a forty-five minute vocal exercise before we play to warm up the voice. Warming up and keeping the voice in shape is the best way to combat vocal tiredness. Other than that trying to get plenty of sleep, not smoking too much not drinking too much is also very helpful for vocal health. 8：In your videos, e.g. "Here It Goes Again", we fond that there is a lot of dancing & physical exercise footage. Do you like dancing & sports? What kind of exercise do you usually do? When I can get myself to do it, I enjoy exercising. Dancing is fun, but I don't do it much. Andy our guitarist, exercises almost everyday, and I really admire him for that. I don't know where he finds the energy. But yeah, Andy is strong! 9:Have you ever enjoyed Karaoke?Where?In Japan or in the States?What song did you sing? Yes, Karaoke is fun. I've done it both in Japan and the States. I always use to do Take On Me by A-Ha. Lately I've gone a little more epic and do Turn Around Bright Eyes by Bonnie Tyler. 10:Do you have any exclusive (your own) stylist? What type of daily outfit do you like? Style is really a day by day thing for me. I almost never want to wear the same thing for very long. Sometimes I want to wear a suit, other days jeans and a sweater. It really just depends. We pretty much do all our own styling. If things are really busy we have a few friends who help shop and style for us. 11:What is your favorite sound, tone? What is the sound that you do not like? Why did you choose both? Please let us know the reasons simply. There's something very pure and relaxing about the tone of a sine wave. I hate the sound of grinding teeth it drives me crazy! 12:What is "beautiful" for you? Is there any your own standard/level or symbol of beauty? If so, why? Please explain simply. Beauty is often quiet and hard to pin point. I love a clear sky at night when it seems like every star is out. I suppose beauty is when something makes me feel at peace with myself. 13:What is "silence" to you? What does it mean? Can you explain briefly, please? Silence is reflection. When things are silent it seems all I am left with are my thoughts. It's not all that often that things are truly silent for me, but when they are I relish the moment. 14 :Please let us know your favorite way to relax. I mean, what do you do if you feel you are too tired and nervous? How do you like the way? If I am tired or nervous I often try to be by my self and just take deep breaths until I calm down. Classical music often has a calming affect on me as well, so sometime I will try to lay down and listen to music. 15 : What kind of bird do you like? How come ? Blue Jays are really beautiful birds and not all that common. I grew up in Michigan where I would see a lot of Blue Jays. They are unique in color, and seem like generally nice birds to be around. They just like to hang out on trees and mind their own business. 16 : What is your future plan? Tim Nordwind:OKGO will be on tour all over the world this year and also making a ton of videos. 17 : Please write message to your Japanese fans, espacially girls. Hello to our Japanese fans! We can't wait to play at Tokyo Unit in Tokyo. Please make us presents, we love present!!!! !See you soon. xo. OKGO. Posted with permission from EMI Music Japan. All rights reserved by Tim Nordwind ( OK GO ). 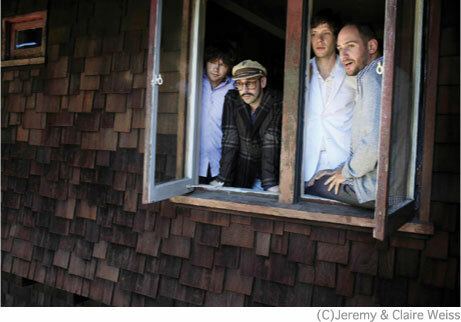 OKGO, the mind-bending 4-piece band from Chicago since 1999, is the most-downloaded band ever. Their pop rock music influenced by new wave got critical acclaim and created an international phenomenon in 2005 with a super-hit tune "Here It Goes Again", which is the decade's most viewed music video and gave the band the 2007 GRAMMY(r) awards.Besides amazing music career, they has kept themselves busy with an assortment of activist endeavors - a testimony and performance in support of internet neutrality before a US Congressional Special Task Force, making a record accompanied only by trombones, a play, writing an essay, clothe-line modeling, charity for New Orleans after Hurricane Katrina. With the latest funk-edged psychedelic new album "Of The Blue Color Of The Sky", which is produced by ex-Mercury Rev member David Fridmann(Flaming Lips, MGMT), OKGO is ready for the one and only Tokyo show on Feb 26, 2010. 1:De quoi vous inspirez-vous quand vous créez votre musique? 2:Quel est votre bruit préféré et celui que vous détestez le plus? Le sonnette d'email <=> Le son d'un talon peu délicat. 3：Qu'est-ce que vous aimez comme oiseau? 4：Où se trouve votre lieu préféré? A l'intérieur de la maison un jour d'orage. 5：Lesquels de vos chansons（ou CDs) préféréz-vous?Pourquoi? C'est l'une des choses ce qui doit rester secrete. 6：L'autoroute ou la plaine, laquelle préfèrez-vous? 7:Qu'est-ce que c'est, le silence pour vous? Pour moi, c'est la paix éphémère. 8:Si vous pouviez vivre une autre vie, que voudriez-vous devenir? 9：Qu'est-ce que c'est la beauté pour vous? Le moment que l'instant dure pour l'éternité. 10：Quel est votre paysage préfére à Paris?Où se trouve-t-il? Les sillages d'un avion qui croissent. Et quels livres sont-ils sur votre table de nuit? 12:Qu'est-ce qui vous plaît le plus comme méthode relaxante? 13:Pour vous, quel est le meilleur moment dans la journée?Quel est votre passe-temps favori? Je regarde, je touche, je sens, je mange et je bois...tous ces moments sensuels. 14：De quoi êtes-vous fou en ce moment? 15:Donnez un couseil ou un message aux fans de votre musique, s'il vous plaît? Pourriez-vous me donnez un message? All rights reserved by Jun Miyake. 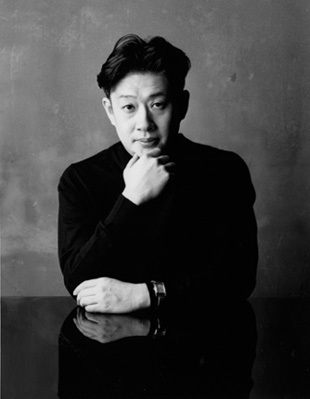 En automne 2005, Jun Miyake s'est installé à Paris pour continuer son travail créatif,porté par une énergie subtile.2009, il a été sélectionné comme par les Galeries Lafayette pour leur Départment Homme. Vous pouvez écouter tranquillement une select de 112 titres au total, une sélection qui couvre les compositions de 21 album [en Octobre 2009]. Translation of answer:Satoko Kawabata, Yukiko Yamaguchi, Jun Miyake. 1: When you sing your songs, what do you comes into your head? What would be the best keyword which express what are your song? When i sing my songs, i try not to think about anything but to feel the music and focus on the lylics,just trying to really lose myself in the songs.I guess i would like to use "sensual"to describe my songs.Something that makes every sense of you pops out. I am not sure what my keyword is for a singer. 2:Now, Which song(or CD) of Bei Xu do you like best? Why? I like all the original songs because it's my own creation and i feel much more personal to them. 3：Next CD, Which song of NEW CD do you like best? Why? I still like"Blue Moon". It's very well arranged and it's a very good remake from the original.It just seems everything is perfect for this song. 4: What do inspire you to select your songs? What do you need to be inspired in order to select your songs? I guess i have to feel it when i hear the song. That's it. Something gives me goose bumps. 5：What does silence mean to you? 6：What are your favorite noise and what noise do you dislike?What noise? Your favorite noise: The sound of trains coming. 7：a)Where is your favorite Japanese landscape? Why ? I love Tokyo tower. It's so romantic. b)Where is your favorite Chinese landscape? Why ? I don't know if i have a favorite landscape since I grew up in China. with old shanghai houses. It has so much culture. c)Where is your favorite N.Y.'s landscape? Why ? For New Yorks is the same, i love the village, all the boutiques shops and cafes. 8：What beauty means for you? Beauty means being funny, confident and cute, more personality than outside. 9:When you were a child, what kinds of desserts did you like? Bei xu:Little balls made of rice. 10:What are your strengths?Please a word. 11:What are your weaknesses?Please a word. 12:What kinds of flowers do you like? Bei xu:Anything that smell good. 13：Do you like your house ? Where is your favorite place? I love my house. It's an old shanghai apartment. I love the stairs the most. 14：What is the best in your life? Having my parents, my family and all close friends that support me. 15:How do you relax or unwind? Watch a movie in a movie theater by myself. When i first went to Japan for the fist album. 17:What is the best moment of the day? 18:Please any(brief)message for Japanese fans. It has been great going through the past few years of my singing life with all of you. I am very excited about my next album. It will bring back so much memories that we shared in the past. Enjoy and hope to see all of you soon. Miss you all.